BALTIMORE (AP) — Seeking to boost a thin starting rotation, the Baltimore Orioles agreed to a $575,000, one-year contact with Dan Straily. The 30-year-old right-hander’s deal was announced Friday. He would get a $250,000 assignment bonus if traded. Baltimore rotation includes Alex Cobb, Andrew Cashner, Dylan Bundy and David Hess, and Nate Karns has been used twice as an opener. Cobb strained a groin late in spring training and was activated from the injured list on Thursday. Straily was released March 25 by the Miami Marlins, who chose to give him $1,209,677 in termination pay rather than his $5 million salary, which was not guaranteed. He was 15-15 in two seasons with the Marlins, who acquired him from Cincinnati in January 2017. He was limited to 23 starts last year, when he went on the disabled list twice because of forearm and oblique strains. 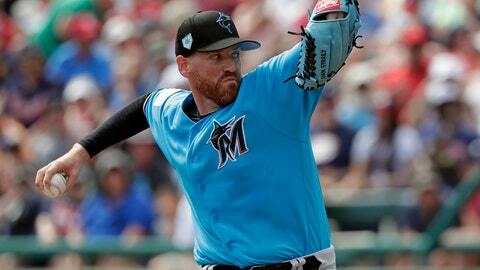 Straily had a 5.94 ERA over 16 2/3 innings in five spring training appearances. He is 42-36 with a 4.23 ERA in seven major league seasons. Baltimore also said right-hander Pedro Araujo cleared waivers, was returned to the Cubs, then was reacquired from Chicago for international signing bonus pool allocation and assigned to Double-A Bowie.